Any tourist’s Darjeeling visit will now be complete, even if s/he does not have a photograph taken on a pony at Chowrastha, the heart of Darjeeling and a popular tourist hangout in town. The once famous ponies of Darjeeling are no longer seen idly lingering around the promenade, thanks to the Darjeeling municipality that has recently issued orders to pony owners to stop their business there. According to him, he has received several complaints from people that said that the ponies had been littering the place. “The ponies urinated and excreted anywhere in the middle of Chowrasta, and the area had started to stink,” Mr Rai said. Samsher Tamang, the president of the Chowrasta Pony Association, however, lamented that the municipality order means big losses for them and that it will hit their livelihood. “There are 22 ponies in the stables at Chowrastha, and pony rides have been a delight for the tourists since 1933,” he said. Further, the Darjeeling Police has decided to be stricter when it comes to stop lighting up at Chowrastha. It may be mentioned that the place is already a ‘no-smoking zone,’ but people still smoke there, not giving two hoots to the ban in place. “With government approval, we might raise the fine for smoking there from Rs 200 to Rs 500 in the coming days,” said S Sarkar, the Additional Superintendent of Police, Darjeeling. 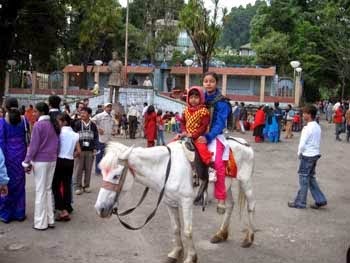 Darjeeling Chowrastha ponies go, cops to implement smoking ban - Any tourist’s Darjeeling visit will now be complete, even if s/he does not have a photograph taken on a pony at Chowrasta, the heart of Darjeeling and a popular tourist hangout in town.